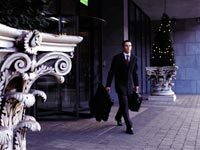 The Trinity Capital is a superb hotel offering modern spacious accommodation of a very high standard. They also offer special packages including a Dublin visitor special, glamour central- girly weekend, anniversary weekend package, VIP weekend package and a Dublin marathon package. The staff leaves no stone unturned to make sure that every need is looked after. The exceptional friendliness of this hotel guarantees the guest a warm welcome. The 82 guest rooms are beautiful, combining rich cherry wood with a lovely two tone colour blend. The en-suite rooms are equipped with all modern facilities including broad band internet access and writing desk, safety deposit box and message mailbox. There is also TV, telephone, tea and coffee making facilities with a tasty treat, hairdryer and a power shower with nice toiletries. The oval-shaped mini suites include in room HiFi Systems, Jacuzzi baths, a double vanity unit, fluffy robes and slippers, everything the guest needs to feel pampered and special. The Siena restaurant offers a great dining experience at reasonable cost. All meals expertly prepared and presented. They serve a wide variety of delicious meals catering for all palettes from vegetarians to the steak lover to the good old fish and chip devotee. And the guest enjoying a movie in the bedroom can call room service and be served a delicious movie snack. The Trinity Capital is located on Pearse Street adjacent to Trinity College. Trinity College is the oldest university in Ireland and a great tourist attraction with the Book of Kells and the Old Library. Grafton Street is just a step away and there the guest will enjoy great shopping combined with free entertainment from all the talented buskers. Famed Temple Bar is within short walking distance and it is the hottest spot in Dublin. The guest will enjoy the laid back bohemian atmosphere, cobblestone streets and quaint shops. For theatre lovers the Olympia, Gaiety, and Abbey Theatres are all close by. To get a feel of Dublin’s history the Natural History Museum, The National Gallery, Dail Eireann and Dublin Castle are all within walking distance.